Last weekend I had a three day holiday backpacking in the “wilderness” of NE China. Too bad the best wilderness around is along the North Korean border and private party backpackers are not allowed inside (at least not legally). 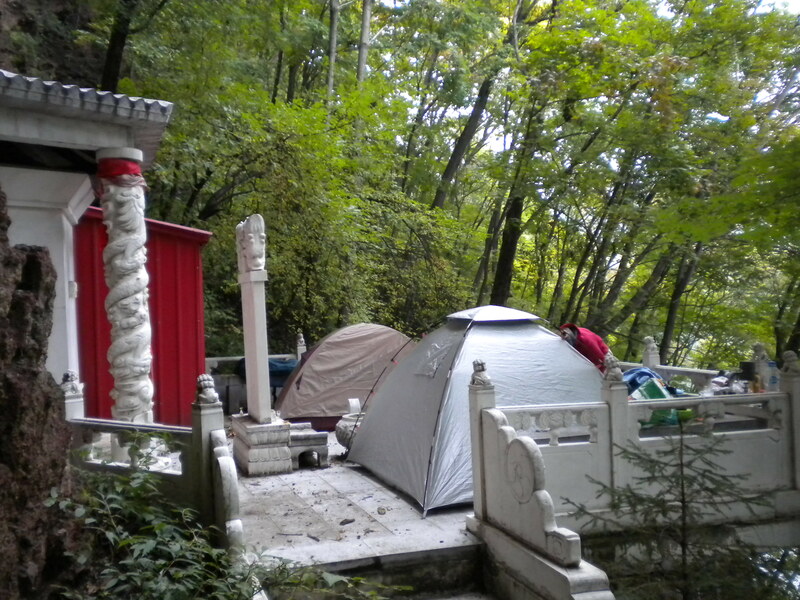 My friend Elisabeth and I had a plan to camp in the Jilin Longwan National Forest. Actually, nearly 2 days of the 3 were spent in travel, such as it is in China, but that doesn’t mean that adventures weren’t had, they just are the kind that you are looking forward to when you set out to go back-country camping. Throughout our trip, we had conversations with people who clearly could not fathom what would possess us to do such a thing. The most common questions (other than “where do you come from?”): “Are you lost?” Of course not! “Your bags are so big! What is in them?” “It is too cold!” Not if you pack right “Aren’t you afraid?” Afraid of what? Then, after having a conversation with us in Chinese, would turn to their neighbor and in our full hearing of their Chinese continue to talk about how we must be crazy (what are they thinking?) 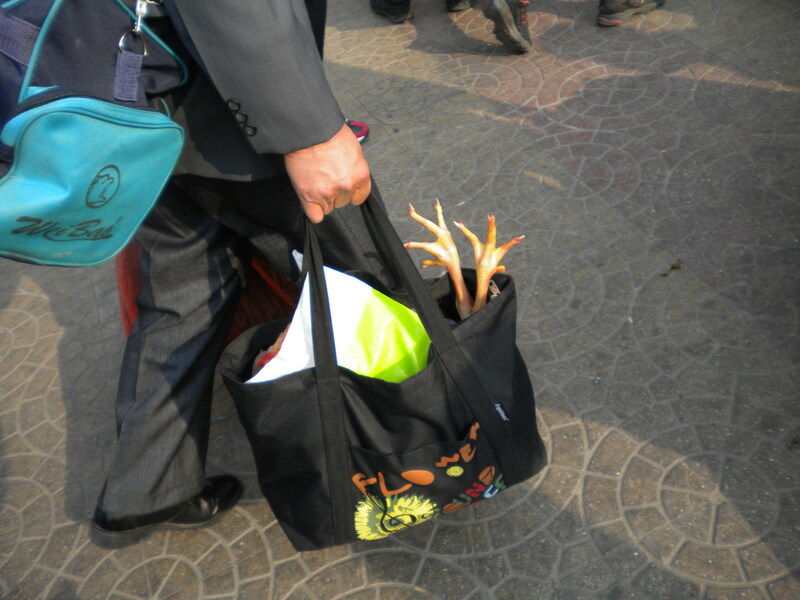 and that our bags are so huge and that the foreigners do such strange things, etc. We just smiled at each other. Of course we also talk about the strange things that the Chinese do right in front of them, only in English. On the train ride out, we commented on the fall colors, or rather the lack of them in the city. As you travel out, you can start to see some color change, but everything, including the greens, are muted, dulled, and dimmed by the dust and haze of pollution. Colors don’t turn as bright. Leaves brown and dry, then fall without glory. Finally, breaking free several hours in all directions of any sort of metropolis, we weren’t disappointed. The couple days in the park were fully satisfying of fall color and air, but it truly was not long enough. We had a destination, but we weren’t sure quite how to get there. I managed to get train tickets (with seats!) on October 1st, one of the busiest travel days of the year. From there, we had to figure out how to get to the forest. Neither of us know of people who had been there before and there isn’t exactly a plethora of travel blogs about this area. So we got off the train, checked out ways to get back home (also a mystery at this point) and figured out how to get there. It was further away than we thought, but we landed a ride with a driver who was taking people in the same direction (getting ripped off of course). We were halfway there when the driver traded us off to another driver who took us the rest of the way (at no extra charge) but we had another set of companions going in the same direction. Finally, not long before dark, our ride dropped us off at an entrance that we saw was located on our sketchy map, and figured that there would be camping inside that part of the park. This is China; after all, you can camp pretty much anywhere. Ahhh! At last walking, filling our lungs with fresh air and our eyes with scenery! However, as we walked on this narrow, almost non-trail skirting a lake along a ravine that went steeply up, there happened to be no sign of flat space. Losing hope of finding one before darkness, we decided to try to bushwhack up, to get to the top of the ravine where I might flatten out. Not a bad idea until we hit a particularly steep patch and my foot slipped on the very soft terrain. My pack, with the plastic cover became a sled and I slid down perhaps 150 feet crashing within feet of the lake! Elisabeth yelled for me to respond if I was OK, but then I heard her crashing down the same way! Nobody hurt, thank goodness! I still laugh thinking about it! Well, we picked up the “trail” again, and thought we should stick with that for now. A couple of minutes later we were both relieved and astonished to see a Buddhist shrine built out of the wall of the ravine. A concrete structure with a flat part built out – more than big enough for our needs, with tables to boot! Better yet, a set of steps from the lakeside to the shrine! HA! One of the more interesting campsites I have ever had! The second day brought us a beautiful hike through forest that eerily reminded me of the Smoky Mountains. The strange part was that 3.7 km of the hike was on a 4 foot wide boardwalk that was built to accommodate people who don’t want to get their hiking boots dirty. As we came out to another part of the park, we asked about and bargained (not very successfully) for a ride to another nearby camping place, which I had heard was less populated (sort of). We did make a brilliant campfire (how long has it been?) and this campsite was one of the most perfect ones I’ve ever had! Unfortunately it rained that night and except for a brief respite (long enough for us to heat water for coffee), it rained all the next day. My friend’s stuff got soaked and so we decided to head back a day early. It is no fun to camp in the rain and as her sleeping back was wet, not even reasonable. All I can say is that the last two hours of hiking in the light rain through the forest put me in a completely different place and am so grateful for it! Earlier I had put China’s wilderness in quotation marks. While I have been backpacking in China where there truly were no other people around, it was not the case this time. The understatement is to say that enjoyment of nature by different people is experienced in different ways. We encountered hikers with radios playing out loud (the birds aren’t good enough for you?). Both nights, as the quiet of the evening, even with sounds of motor boats on the lake it was pleasant enough, but that gave way to the sounds of karaoke and radios and other parties. Oh well. While frustrating, we were just as happy to be where we were, and I would certainly return again to such a beautiful place. For a couple of city girls who love the outdoors, there is nothing better than getting out where we were. It is more work and more trouble to get to be in the great outdoors here, but I’m ever so grateful for the opportunities when they come around. These days also give rise to reflections about living in China, which I’ll share in the next post. I saw this at the train station and suddenly remembered the thing that I forgot to bring on the trip! could've had roast chicken on the campfire! 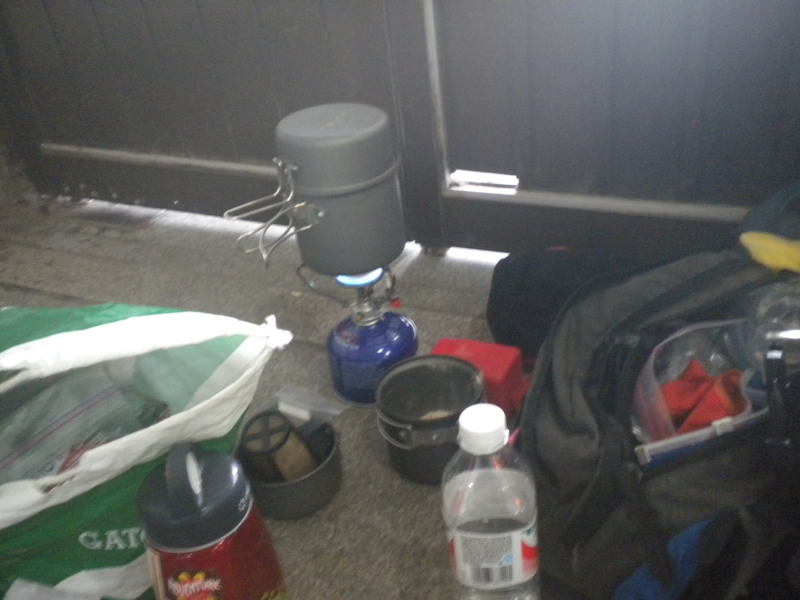 making camp at the bus station: cooking soup and brewing coffee - it was quite a scene for the locals! Categories: adventure and sport, expat life | Tags: camping, travel | Permalink.